Fruits of the season are singing to the farmer with sweet smells of ripeness. The red berry aromas and dark colors from the raspberry patch, the citrus floral characters from the hops and the color change on the grapes; these are all signs that we need to shift gears into evaluating ripeness and scheduling the next phase of our jobs, the harvest. I don’t make things very easy around here. We have a number of different crops that all seem to come in around the same season. We picked our first batch of hops yesterday. These are Chinook hops and most are destined for our Attitude Adjuster hard Apple Cider. The tall string of hops is called a bine. 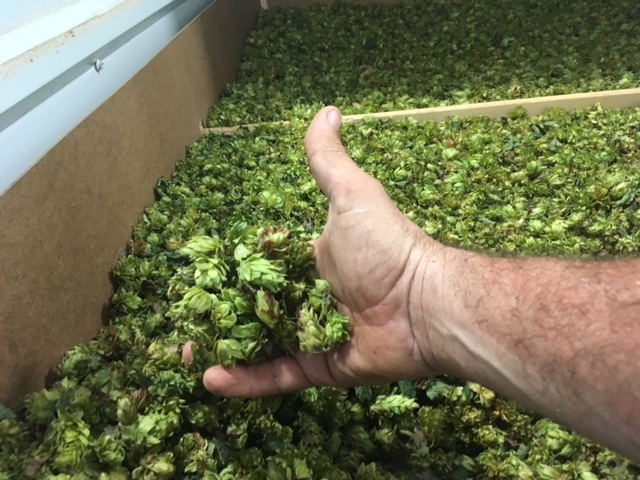 These are picked off the farm and transported down the road to Black Hops Farm, AKA Vanish Brewery, where they are run through a 1970s era picking machine to remove the hops combs from the rest of the plant. Then they are dried over a 10 hour period and refrigerated to be pelletized and packed in a few weeks. We took over the operation of the processing part this year and fortunately it kind of works like processing grapes. Timing, equipment, quality control, staff training and understanding parameters are all in play for a successful product at the end. It was a very challenging year to grow hops so there is a limited crop. I am not complaining as this gives us a chance to learn the process and equipment without the pressure of full production. The next harvest for us is raspberries. We have fall bearing plants on our farm so harvest starts in August and can go into late September. Because these will go into wine, we freeze our early batches of fruit and ferment once the freezer is full. This is used in wine so we can pick the berries when they are really ripe and don’t need to worry about shelf life or transportation issues. We will also buy seconds from other growers who need to make a pretty pint for the grocery store shelf and don’t want to waste a good berry that might go bad in a couple days. Asian Pears is our next pending harvest. We have a 3 acre orchard of trees that is quite resistant to diseases and other challenges. Once picked, these can stay in the cooler for a few days if needed. These will be used for our various pear based wines, but we are planning on picking and packing some for whole pears as well. I have some restaurants and produce stands that are interested. I guess we need to think about grapes as well. For our area, harvest usually will begin in early September. Whites are usually first and then the reds come. Warm days, cool nights and DRY is our best weather to ripen our crops. This year the weather has been challenging, but not devastating, so far. Keep a good thought for all the farmers so our crops come in well and we stay safe through the process. Farmers grow most everything we eat and drink!